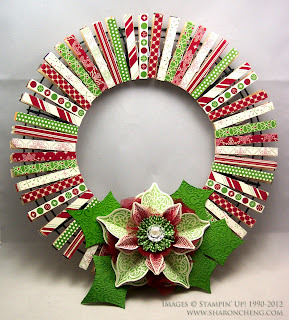 This cute Christmas wreath is made using clothespins. Two of the demonstators in my group made clothespin wreaths for fall and they inspired me to make this one for Christmas using Stampin' Up! 's Be of Good Cheer Designer Series Paper. Because the wreath uses clothespins pinned to a wire frame, you can decorate the other side of the clothespins for a different season. When it's time to change your decorations for a different holiday, you flip the clothespins around and you have a wreath ready for your next event. I like the idea of using the same wire frame and changing out the clothespins. It greatly reduces the amount of storage space you need. On the other side of the clothespins, I used Stampin' Up! 's Howlstooth & Scaringbone Designer Series Paper which can be found in Stampin' Up! 's Holiday catalog. 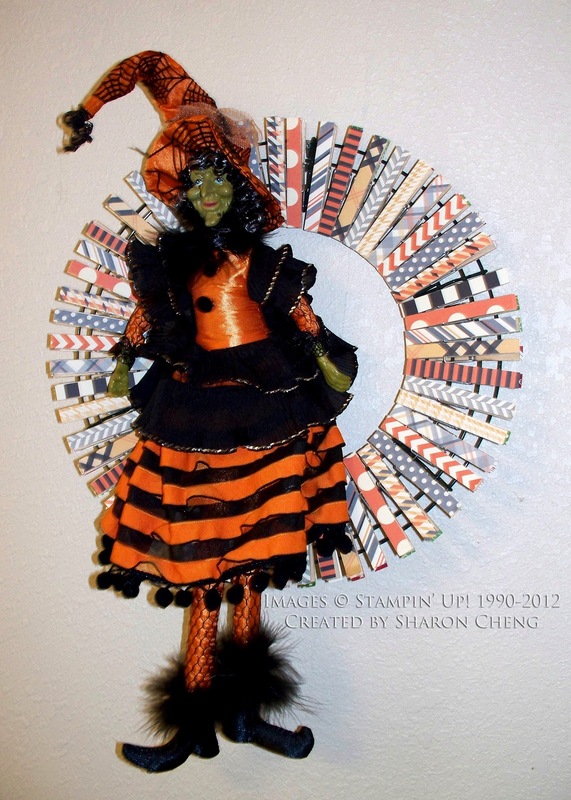 This paper is perfect for Halloween, Thanksgiving and fall. 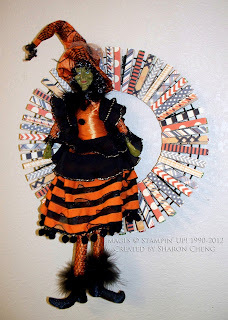 My friend, Connie, gave everyone this Halloween witch at our fall scrapbook retreat. She was perfect for turning this into a Halloween wreath. To decorate the wreath, I CASE'd the ornament on the cover of the Holiday catalog using the Ornament Keepsakes stamp set and Holiday Ornaments Framelit dies. I didn't have the Designer Rosette Bigz XL die with me at the retreat, so I used the scallop circle punch to make a slightly different rosette for the center of this ornament. 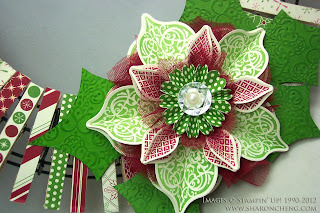 For the center of the ornament, I used my new favorite combination of Stampin' Up! 's vintage faceted designer button and a pearl. Using a hot glue makes it easier to assemble the ornament and add the tulle. 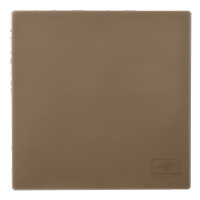 When I'm working with hot glue, my new favorite tool is this 6 x 6 silicone craft sheet. It protects your work surface from the hot glue and the heat from the hot glue gun. When you're finished, you can pop off any of those hot glue bits that end up on the silicone craft sheet. Here is the Valentine's Day version. It was fun figuring out how to make the rosette heart. 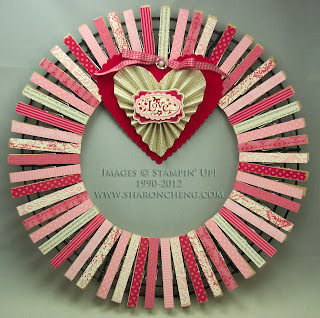 You can make the clothespin wreath for both Christmas and Valentine's Day in a class I'm teaching. The kit includes the wire frame, clothespins and everything you need except for adhesive. Contact me at sharon@sharoncheng.com to register for this class.